I've always had a soft-spot for Copenhagen (in Danish, København). It was the first European city that I ever visited, when I packed up my bicycle to head off on a 3-week bike trip through Denmark, 30 years ago. 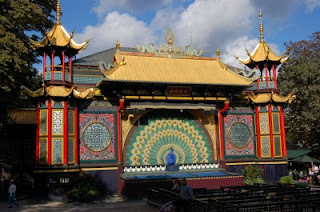 And each time I return, I'm reminded of what I like about it: the quaint, almost provincial feeling that every Scandinavian city has, with its old forts and walls, lots of waterfront, royal palaces guarded by Wizard-of-Oz soldiers, and the obligatory amusement park (in this case, Tivoli). And add to that Denmark's progressive ideas and the unique counterculture-scene, and I was quickly hooked. Copenhagen also has some very quirky architecture, with spiraling towers and steeples, and there's a nice tradition in the dark winter months, when the pubs and restaurants place inviting oil-fired torches at their front doors. Danes have a word for such warm, cozy atmosphere: hygge. 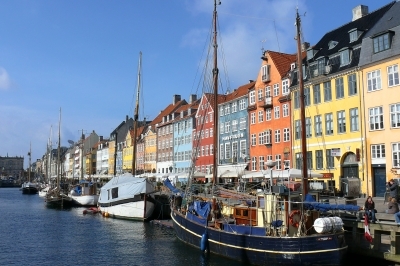 Here's a route that takes you through a cross-section of the most interesting Copenhagen sights: through the main shopping district, along the old harbor, past the royal palace, through the old fort, through parks and palace gardens, and the university neighborhood. 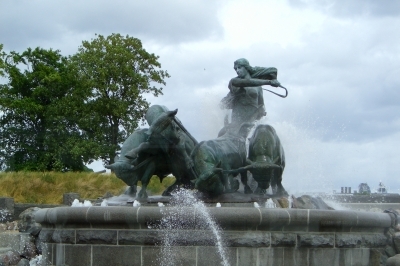 We'll start at the City Hall (Radhus) plaza (Radhuspladsen), not far from the main train station and Tivoli amusement park. We are already among weird towers. The neo-gothic city hall has a gothic one, the Palace Hotel behind the plaza has a renaissance tower, and the building next to it has its own nondescript tower. Standing with the city hall to your left, looking southwest across the busy Hans Christian Anderson Boulevard, it's just block to the Tivoli main entrance, and the main station. But let's turn our backs to that and run in the other direction, up Strøget street, between those traditional Danish establishments, 7-Eleven and Burger King. The next kilometer will be heading straight through the downtown shopping district, with lots of pedestrians. But the further north we run the clearer the street will become. In 3 blocks, we'll pass through an old plaza called Nytorv, with its nice fountain and kiosk, and continue straight ahead. The street name changes with about every block, but the name Strøget reappears occasionally, too. At the next big plaza, Højbro, you'll see Copenhagen's landmark department store, Illum. Run past it straight ahead and you'll eventually get to a gigantic plaza, Kongens Nytorv. Run straight across it and you'll come out at one of the liveliest evening spots in town: Nyhavn (New Harbor). They lied with the name: it's actually very old, with restaurants and pubs lining the narrow, canal-like harbor full of old wooden boats. Run down the left side of the water, that's where the most action is found. Run down to the end, and the canal leads to the main bay. Now turn left to run along the water, running along the wooden walkway going out over the bay, behind the new theater building. After the new building, turn left again to run through St. Annæ Plads to the front of the Front Hotel (naturally) at Larsens Plads. The new opera house sits a bit forelornly across the water. Turn right onto Larsens Plads. In one block you will see a modern park on the left, Amalie Gardens, where you can run into it and continue to the big fountain in the middle of the park. At the fountain, turn left to run the one block west to Amalienborg Palace. There is a big, octagonal plaza in the middle, surrounded by a bunch of identical palace buildings: four separate palaces, now all owned by the royal family. It's hard to tell the one that houses Queen Margarethe, but I think it's on the left side. The palace guards add a scenic touch to the whole setting. You'll see the dome of the Marmorkirke (Marble Church) two blocks further west. 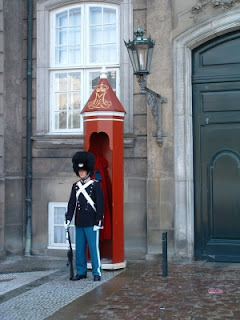 Turn right here on Amaliegade and run past some small ministries and palaces until you come to the fort. First, on the left, you'll see the Frihedsmuseet, dedicated to the Danish resistance in World War II, then running straight, you'll pass the very English-looking St. Alban's Anglican Church. 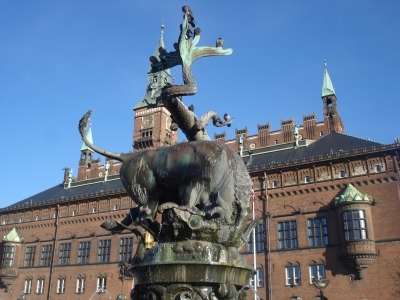 Just after the church, you'll see a big fountain (Gefion Fountain) with bulls being driven into the water. Run along the right side of the fountain, then over the little bridge, then keep running north with the bay to your right side, and the fort to your left. 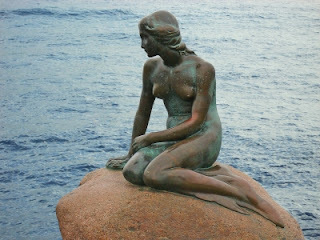 In a few hundred meters you'll come to Copenhagen's most photographed spot: the Little Mermaid statue. Hopefully for you, her head won't be sawed off again, like some pranksters have already done. Now turn left to follow the path towards the left, going along the moat outside the fort, called the Kastellet. You can cross the drawbridge to the left into the fort from the north to run through it to come out on the southern drawbridge. After you exit the fort on the drawbridge, you come to an island in the moat. Turn right here and run on the narrow strip of island until it makes a sharp right turn, following the moat. Right here, though, turn left and run out of the fort park to the street, Grønningen. 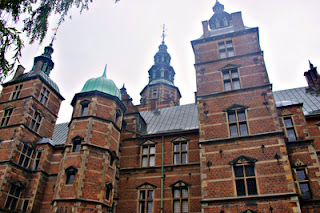 It would be nice to stay in the fort park, but we'll take a little tour through one of those strange and provincial neighborhoods that give Copenhagen its real character. Turn right on Grønningen and then left again after 2 short blocks, at Jens Kofords Gade. You will now run through the old barracks housing for the fort soldiers, built a couple of hundred years ago. The long yellow row-houses with no front yards are now occupied by young families. It's appealing and also somewhat appalling at the same time, kind of an architectural sweet/sour dish. When you get to the first chance to turn right (Kronprinsessegade), take it. 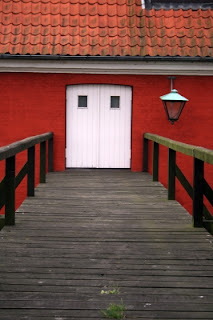 This will lead you out of the barracks onto Østervoldgade, where you keep running north the one block back to Grønningen. There, you turn left to run by the Østerport train station, running over the bridge crossing the tracks. This is the northernmost part of the run. We'll head back now. On the other side of the tracks you'll see a park, the Østre Anlæg. This, too, was built around the zig-zagging moats of the old city defenses. The park is always open, so no problem running any time you feel. Run the zig-zagging paths along the water, going past the art museum, to the end of the park, at Solvgade. When you come out of the park, directly across the street is the botanical garden (Botanisk Have). But it closes at 18:00 in summer, and even earlier in winter, so you probably won't be able to see this beautiful park. So turn right on Solvgade for a little tour through another interesting row-house neighborhood. At the next block, Øster-Farimagsgade, turn right and run just 2 short blocks, looking at the side streets on the left. These are the row-houses, nicer ones than the barracks, possibly officers' quarters. Turn left on one of them, like Wiederweltsgade and run to the end, which is at the old moat along this side of the town, Sortedams Sø. Here you can turn left and continue running along the water, back towards town. NOTE: This section of the run overlaps with another great route, Copenhagen's most popular run: the Lakes Route. Run to just before the second bridge, a few hundred meters down the lake, and turn left down Gothersgade. You will run by the southwest side of the botanical garden, cross Østervoldgade again and then come to one of the city's best palaces, Rosenborg, on the left side. This moated renaissance palace is now a museum, housing the crown jewels. Take the chance to run a loop through the palace gardens, coming back out on Gothersgade. Now cross the street at Det Danske Filminstitut to run down Landemærket into the university neighborhood. This is one of my favorite neighborhoods in Copenhagen, full of interesting pubs and hangouts. It's a good place to explore in the evening. The street name changes to Krystalgade and then ends at Nørregade. Turn here to run past the Vor Frue Kirke (Our Lady Church) and then comes out at Nytorv again, which we crossed earlier. But this time, turn right at the beginning of the square, on Gammeltorv, and run the two blocks back to the Radhus down this old shopping street. Maybe now you can head over to Tivoli and take a look. At night, this old-fashioned amusement park is a wonderland of lights.